The thriving cotton industry brought Jewish merchants to the southern states of the US in the 19th Century. 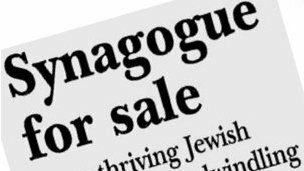 Their synagogues once attracted hundreds of worshippers but now, many Deep South Jewish communities are preparing to shut up shop. I didn't come to Mississippi to bury the Jews of the Delta. I did come to mourn them. But stories don't always turn out how you think. Life is different in the Delta, a swathe of hugely fertile land on Mississippi's western border with Arkansas. Life is slower in the Delta. There's not a lot of hurrying - there's an awful lot of eating. And the people are different too. There's the guitar-wielding rabbi. The 76-year-old bar mitzvah student. The southern belle in her 80s who goes to synagogue every Friday night. Jews came to the Delta attracted by its wealth - they became the middlemen, serving both those who drew gold from the rich land, and those that had to pull it out of the soil. They became the merchants, selling clothes and groceries and medicines and cloth. 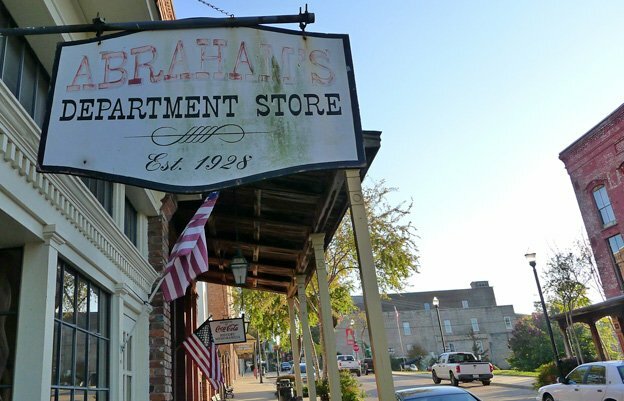 Main Streets in small towns up and down the Delta are dotted with faded shop signs announcing Abraham's and Levy's, Goldberg's and Cohen's. There were never that many, says Stuart Rockoff, until recently historian for the Institute of Southern Jewish Life in the state capital Jackson. There are maybe 2,500, around 1% of the population of the Delta. But because of their religion and their trade, they were very visible. Not for much longer. "Ask them," says Stuart Rockoff, of the Jews of Delta towns, "where their children live". In truth, there was no need to ask. A journey into the Jewish Delta is into warm welcomes, tiny congregations, long memories and strengthened faith and love. Listen to Jonny Dymond's tour of the Jewish communities of Mississippi on Radio 4's Broadcasting House programme on 29 December or catch up on the BBC iPlayer. "Now we are down to just a few people," Stan Kline, 77, tells me in a slow southern drawl, in the town of Vicksburg, the southern mouth of the Delta. "Our place in history is slowly eroding. We face it with dignity, and we hold on with all we've got." Kline looks like your favourite uncle - or how he ought to look - gentle and generous, a round kind face beneath a shining bald head. He's spent 52 years in life insurance. He knows a thing or two about when your term is up. 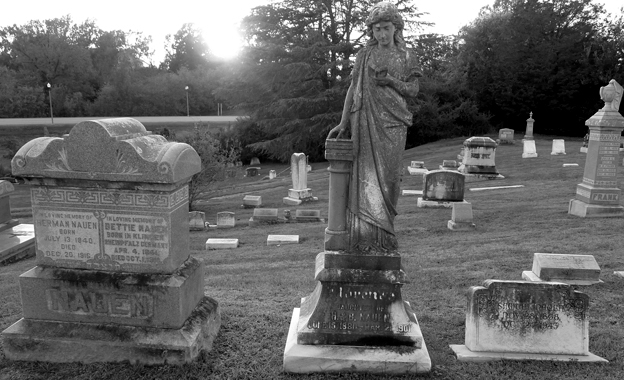 The big concern of the 15 or so Jews who live in Vicksburg now is not for the synagogue they go to every Friday night, but for the cemetery where their loved ones are buried. It needs, Stan Kline says, perpetual care. "We're planning for the future of our congregation when we can no longer physically be here to do it ourselves. "We are nearing the end and we all know it. And that's another reason we hold so tightly to our bond of being together on Friday night." Around the table, food and drink and conversation happily swirls. But there are no children at the Sabbath table. 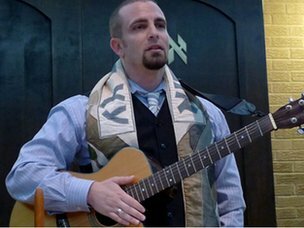 "Every single Friday, they get together," says the guitar-wielding rabbi, Marshal Klaven, who visits the Vicksburg Jews when he can. Rabbi Klaven - an ex-US Air Force chaplain, with the beefy physique of a man who takes his workout seriously - is, quite literally, a wandering Jew. He has spent years roaming the 13 states of the old South, holding services in congregations too small to support a full-time rabbi, and rallying the faithful. He bubbles with enthusiasm for his life, his mission, the dwindling communities he serves. "They get 90% turnout," the rabbi exclaims, of his Vicksburg congregation. "If a large community had 90% turnout, to be honest, there wouldn't be enough parking spots let alone places in the pews." His first visit in Vicksburg is to Ann Gerache, a petite woman in her 80s with perfectly coiffed silver-white hair. Her home is spotless, and suddenly too large for her. Her husband, Joe, passed away recently. He ran the corner drugstore in Vicksburg. "The old railroad men," she remembers, "would come in every spring, and want a cleanout, a tonic. And it was made in the back of the corner drugstore. It was a wonderful Vicksburg place." 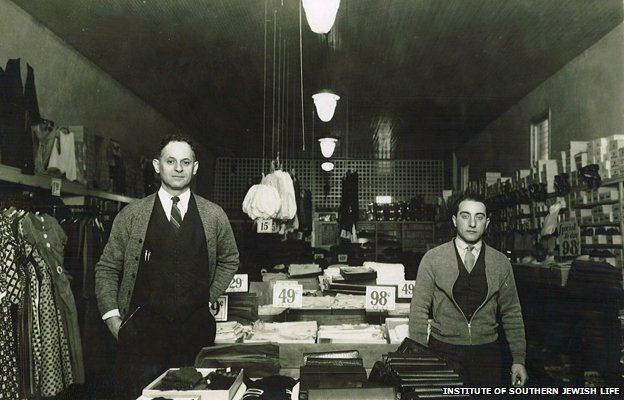 Back then 10 or 12 of the stores were Jewish-owned and run. Now, where once there were active businesses, an Historic Quarter has been created for tourists to come and see, and browse amongst what are now museums and craft and coffee shops. Just one shop is Jewish-owned and run. "I think around 1900 there probably were 600 Jews - souls - living in Vicksburg," says Ann. 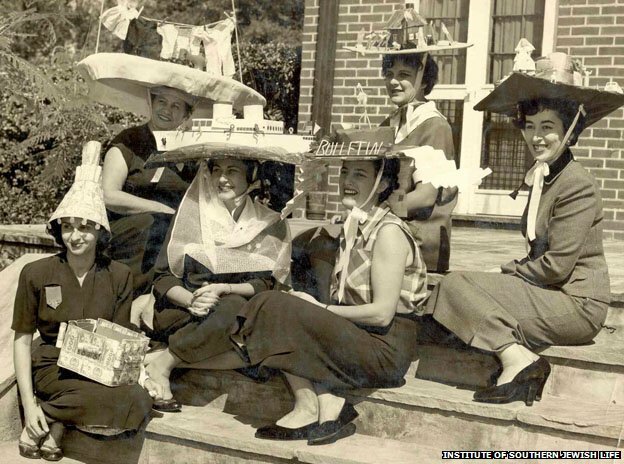 "When I came to Vicksburg in the middle 50s there were 70 women in the Temple Sisterhood. We haven't had a Sisterhood meeting in 20 years." On the road north to Greenville the brown earth stretches far out to the tree line. The cotton and the corn have been harvested. Three houses spin by, some kids shooting hoops outside. "When I go into some of these declining congregations, it is to help them navigate what will be very difficult realities in a way that honours their history and that ensures their continued legacy," says Rabbi Klaven. A corn silo goes by, eight cylindrical silvery tanks by the roadside. There is an unending grey sky overhead. "There's nothing sad about it if one has lived the reality well, and these congregations certainly have. And now it is my job to bring an honoured end to their congregations, but one that allows their stories to continue." On a wet Saturday afternoon in Greenville, it is difficult to imagine what remains of the stories. What was the town's main shopping street is deserted. Most of the shops are empty shells. There's almost no traffic, no-one on the pavements. It is a desert. "Greenville: Heart and Soul of the Delta" proclaim the lonely little banners fluttering on damp lampposts. Many children of the Delta Jews never really came back to Mississippi after the war, and then the big box stores put the squeeze on the hatters, the tailors and grocers. When the parents sold up, many joined their children in the cities or went to the coasts. In the 1920s and 30s, the congregation at the synagogue in Clarksdale was the largest in Mississippi. But by 2003 it had a little over a dozen members and the community decided it could no longer continue. Former members came back for a farewell service, filling the synagogue for the first time in decades. The Torahs were found new homes - one to a new Jewish congregation in Poland. The building was sold, leaving the cemetery as the last vestige of what was once a vibrant Jewish community. At the Greenville Jewish Open Golf Tournament dinner, the talk over the chopped liver and steak is of numbers, how many each community has - families or individuals - and a shaking of heads and a competitive smile. A Jewish adult education group from California is visiting, part of a Jews Blues and Jazz tour. The Delta Jews are becoming a rare tribe, to be visited before extinction. The Californians spend their days poking in amongst the sepia photos and yellowed newspaper clippings of soon-to-close synagogues. But none of them appears downhearted by what they find. The group has trodden this kind of ground before, travelling to Eastern Europe to find the remaining shards of Jewish life there. "This here is not as tragic at all," says Fred Rosenbaum, who organised the trip. "It is inspiring to see a remnant here, trying to keep these congregations going." The next morning the Californians come off the coach or stride along the wet pavement in Greenwood, a couple of hours drive east. They head towards Gail Goldberg with a determined air. Goldberg stands in the Greenwood synagogue and tells the stories. 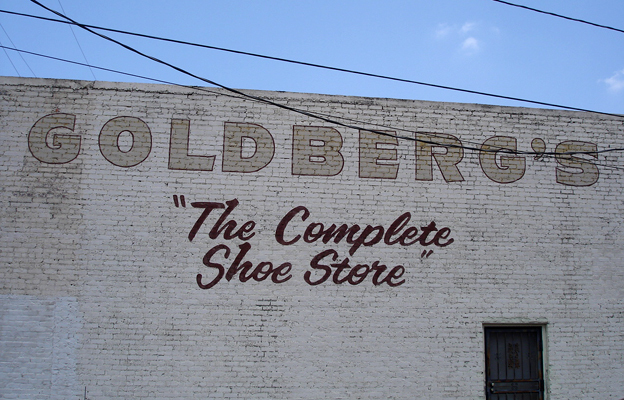 She is one of nine Jews left in Greenwood and helps run Goldberg's Shoes in the middle of town. She is short and slim and bustling and cheery, with the elongated vowels of a southern lady. "Naahn," she says, nine Jews left in Greenwood - not families she points out, but individuals. There is a quiet gasp from the visitors. The dark wooden floor of the synagogue shines. The place is spotless. In a cool dark ante-room four tallits hang, waiting to be draped over the necks of male worshippers. And once the Californians have filed out into the damp day, I ask - Isn't it desperately sad, being part of this dying community? "I consider it a privilege, not a burden," Gail says, slowly, thoughtfully. 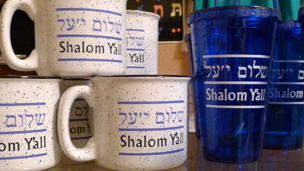 "I consider it a responsibility and, yes, it has definitely strengthened me in my Judaism." 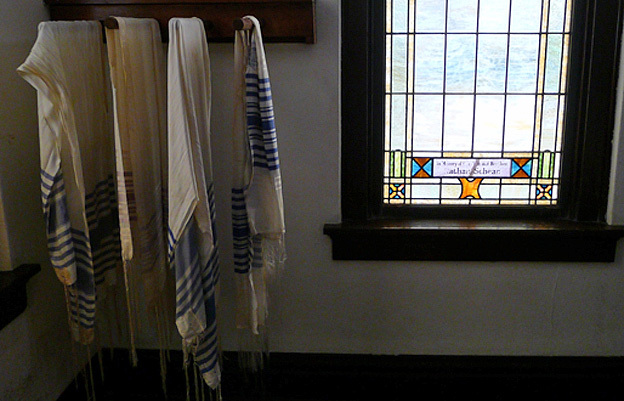 "All of us in this synagogue have a responsibility and a role in worship. And we really work to make sure we continue to gather. "Personally I'm scared to not gather, because I know, if I say, oh it's only three of us, it's only four of us, why are we going to shule [synagogue], why are we turning the lights on, why are we putting the heater on... then we may not continue to exist. So, we continue." It would be easy to pity the remnants of the Delta's Jews, their children gone, their shops all but closed, holding ever-smaller services in near-empty temples. But not one of them pities themselves. 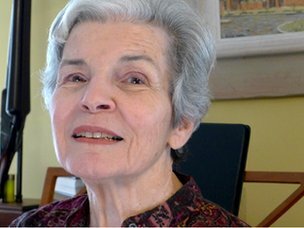 There may be no one left in Greenwood to say kaddish, the prayer of mourning, for Gail Goldberg. But, wherever the rabbi wanders, I think he will. And, with their faith and their love fortified by adversity, so too will the last Jews of the Delta. Slideshow: Production by Paul Kerley and Maria Byrne. Pictures courtesy of the Institute of Southern Jewish Life and Getty Images. Music sung by the choir of the Beth Israel Congregation, Jackson, Mississippi.